BOTTOM LINE: A heartfelt revival about one woman’s struggle to rebuild her life after prison. Newly released from prison, Arlene (Erin Cronican) finds herself homeless, unemployed, and trapped in a new brand of social exile. She just spent eight years in prison and has worked very hard to rehabilitate from being Arlie (Candice Oden), the younger, devilish version of herself. Bennie (Leo Goodman), a slimy guard from the prison, drives Arlene to Kentucky to help her get set up in a dingy, one-room apartment. But, as Arlene soon learns, Bennie plans to stay. Arlene is resistant to his proposition, but her freedom is still new and she is unable to set any firm boundaries. Arlene’s hard-hearted mother (Carla Brandberg) arrives with fresh sheets and cleaning supplies, but she quickly rejects Arlene's attempts at renewing a mother-daughter relationship and offers her more criticism than help. Arlene desperately wants to secure a good paying job and free her son Joey from the foster care system he's been trapped in during her incarceration. Through interwoven flashbacks we see the scope of Arlie's violent tantrums in the past, but we also learn that the root of her inner turmoil stems from abuse as a child. When Carl (Steve Carierri), present-day Arlene’s old boyfriend and former pimp, shows up at her new flat, she must fight to keep the old demons of her past from catching up to her. Getting Out first debuted at Actors Theatre of Louisville in 1977 and then ran Off Broadway in 1978. It was the first work of playwright Marsha Norman, who went on to win the Pulitzer Prize for ’night, Mother. Norman's device of using two actresses to portray the main character of Arlene/Arlie is very effective in creating a stark contrast between the self-destructive Arlie of the past and the self-realized Arlene of the present. The cast gives impassioned performances and Cronican is especially poignant as the determined, conflicted Arlene. Jane Kahler is a delight as Ruby, a fellow ex-con who offers the first glimmer of acceptance and companionship for Arlene later in the play. Cronican is also the production’s director and while every corner of the Lynn Redgrave Theater is well utilized, the pacing tends to lag and lighter moments of humor are lost in the process. That said, the weight and menace of the story remains very much palpable and intact. This production runs in repertoire with a revival of Eugene Ionesco’s Rhinoceros—a play dealing with a similar theme of acceptance as an outsider in mainstream society. Although the production design by actor-director Cronican and Artistic Director Brandon Walker includes a bare bones series of walls and door frames with simple set pieces, you cannot fault The Seeing Place Theater for lack of trying. From the front of house to costume construction, the theatre program attests that the ensemble company gives of their talents to act, direct, and design their productions—clearly, a true labor of love. 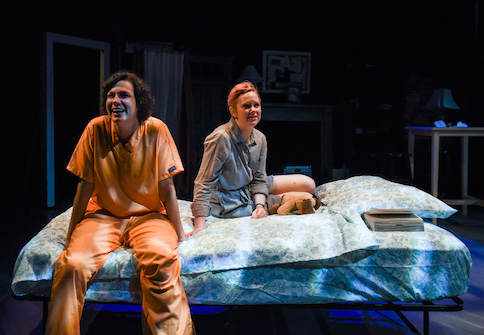 Getting Out is a deeply relevant story that calls attention to the fight of victimized women, a mission that enormously warrants this earnest revival. (Getting Out plays at the Lynn Redgrave Theater, 45 Bleecker Street, through August 7, 2016. The show runs 2 hours 20 mins with one intermission. The play runs in rep with Rhinoceros; performance schedule for both shows varies. Tickets are $15; for tickets, performance schedule, and more information, visit seeingplacetheater.com). Getting Out is written by Marsha Norman. It is directed by Erin Cronican. It is produced by The Seeing Place Theater. Production Design is by Erin Cronican and Brandon Walker. Lighting Design is by Duane Pagano. Costume Construction by Carla Brandberg. Robin Friend Stift is the Assistant Director/Fight Captain. James Hunter is the Stage Manager. The cast is Carla Brandberg, Steve Carrieri, Erin Cronican, Leo Goodman, Jane Kahler, Candice Oden, and Robin Friend Stift.